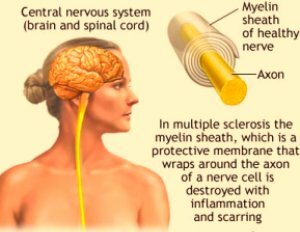 "Multiple Sclerosis Causes Nerve Damage"
Multiple Sclerosis (MS) is an inflammatory auto immune disease that attacks the central nervous system (CNS), which is made up of the brain, spinal cord, and optic nerves. The Name Refers To The Multiple Scars (Scleroses) In The Brain. Autoimmune diseases are characterized by an inappropriate response of the immune system that results in chronic inflammation and tissue destruction. It is a progressive disease, meaning the nerve damage gets worse over time. How quickly MS gets worse varies from person to person. The nerve damage is caused by chronic inflammation. Inflammation occurs when the body's own immune cells attack the nervous system. Repeated episodes of inflammation can occur along any area of the brain and spinal cord. Rheumatoid arthritis, inflammatory bowel disease, type-1 diabetes and multiple sclerosis are all autoimmune diseases in which inflammation destroys tissue, although a different tissue is targeted in each case. Swallowing problems—referred to as dysphagia--What is dysphagia? When dysphagia occurs, food and liquids can pass into the airway and lungs, causing the person to cough and choke. The symptoms may become permanent or may come and go. One Thing Thats Peculiar, Is That The Symptoms of MS, It's Severity, And Prognosis Are Different In Everybody. Each of these stages might be mild, moderate or severe. The majority of people with MS do remain ambulatory. Genetic factors are believed to play a significant role in determining who develops MS. Currently, there is no evidence to suggest that MS is infectious or contagious. The role of a virus or viruses, if there is one, affects only people with a genetic predisposition to develop the disease. Since diagnosing Multiple Sclerosis can be very difficult, a neurologist who specializes in treating MS should evaluate your symptoms. As many as 10% of people diagnosed with multiple sclerosis actually have some other condition that mimics MS.
An accurate diagnosis is based on your medical history and a neurological examination. There is no single test for MS, consequently the diagnosis can be missed, delayed, or even incorrect. Anti inflammatory dietary and lifestyle changes have a significant impact on prevention and treatment of MS. Negative Emotions Will Negatively Affect Your Health And It's Important To Replace Those Feelings With Love, Kindness and Joy. I have been practicing Spring Forest Qigong for about 6 years now. Master Lin says we are all born healers. When I started Spring Forest Qigong I experienced being a healer for myself. I didn't know what I was doing, I had just purchased the level one and two books and DVDs and hadn't even finished them yet, but I healed a knee my husband was scheduled to have surgery on. We went to the same day surgery as scheduled, they took him back, and when they looked at the knee they said you don't have to be here, this knee is fine. The knee was completely normal so we left the hospital and went out for lunch. I have to add the problem never returned. That was my first experience with anything like this. I'll tell you more stories on other pages. Many things take more time and some things simply won't be cured, but this is amazing. Research is ongoing: Omega 3 Fatty Acids, Fish Oil Is Now Being Tested As A Treatment For MS.
An anti inflammatory diet and lifestyle may be a powerful deterrent to the disease and may also be effective in reducing or reversing the progression of the disease. We know chronic inflammation causes or contributes to very many diseases, and fish oil reduces the inflammation. Some scientists believe inflammation may be the case with MS also. (Acorda Therapeutics, with a proposed name change to Amaya) for its ability to improve walking speed in people with any type of multiple sclerosis. While the FDA is not required to follow the recommendations of its advisory committees, it usually does. The agency is expected to make a final decision about whether to approve the drug for market on or before the target date of October 22, 2009. In recent years, Vitamin D has garnered the attention of MS physicians and researchers because epidemiological and laboratory studies have produced strong evidence that low vitamin D levels may play a role in causing MS. Now, leading researchers from around the country plan to converge in Boston to evaluate the feasibility of conducting what would be the largest clinical study ever undertaken to explore the role that Vitamin D may play in MS.
Vitamin D has been in the news a lot lately. What most news stories don't tell you though is that it is Vitamin D3 that you should be taking and not plain vitamin D.